Download UNHCR's Operational Support and Management in English and in French. Elected by and reporting to the United Nations General Assembly, the High Commissioner performs functions as described in UN General Assembly resolution 428 (V) of 14 December 1950 in order to administer and direct the work of the Office of the High Commissioner for Refugees in the performance of its mandate. The Executive Office of the High Commissioner comprises the Deputy High Commissioner, the Assistant High Commissioner for Operations, the Assistant High Commissioner for Protection, the Chef de Cabinet, and their staff as well as the Special Envoy for the Central Mediterranean Situation and the Special Envoy for the Horn of Africa. 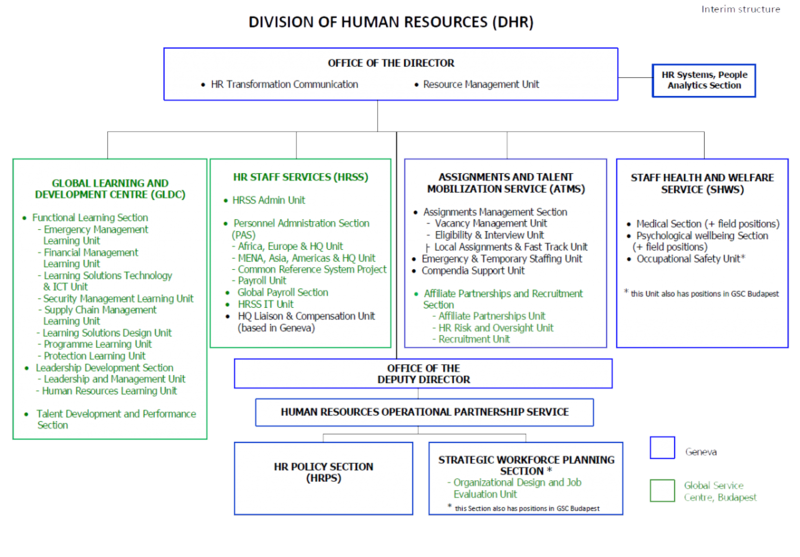 The Executive Office is situated within the larger organizational entity, Executive Direction and Management (EDM) which also includes the Office of the Inspector General, the Ethics Office, the Evaluation Service, the New York Liaison Office, the Legal Affairs Service, the Office for the Ombudsman, Enterprise Risk Management, UNHCR Innovation Service, Change Management (that includes Organizational Development and Management Service). The Executive Office crafts a clear and consistent corporate vision, sets operational priorities and strategies and oversees UNHCR’s activities worldwide. It engages directly with donors and States at the highest level to secure political and financial support for UNHCR. The Deputy High Commissioner (DHC) oversees and provides strategic leadership for all functions related to the managerial, financial, and administrative running of the Office. The Controller and Director of the Division of Financial and Administrative Management, as well as the Directors of the Divisions of External Relations, Human Resources, and Information Systems and Telecommunications report directly to the DHC, who also supervises the Head of the Legal Affairs Service, the Ombudsman, the Chief Risk Officer, the Head of UNHCR Innovation Service, the Senior Coordinator on Sexual Exploitation, Abuse and Sexual Harassment, the Senior Advisor on Inclusion, Diversity and Gender and the Senior Advisor on Private Sector Partnerships. The Assistant High Commissioner for Operations (AHC-O) oversees and ensures strategic leadership and direction for all UNHCR operations in the field, the five Regional Bureaux at Headquarters, the Division of Programme Support and Management and the Division of Emergency, Security and Supply. The Assistant High Commissioner for Protection (AHC-P) ensures that protection focus is instilled into all aspects of UNHCR’s work, oversees the development and implementation of protection policy and legal standards, and coordinates high- level advocacy on protection matters. The AHC-P oversees the activities of the Division of International Protection and of the Division of Resilience and Solutions as well as the Special Advisor on Statelessness and the Head of the Global Refugee Forum coordination team it provides guidance on protection policy to the Regional Bureaux, the Division of Programme Support and Management and the Division of External Relations and to communications relating to protection. The AHC-P works closely with the AHC-O to provide overall strategic direction for operational protection aspects of UNHCR’s work. The Inspector General’s Office (IGO) supports the effective, efficient and accountable management of UNHCR operations, including through preventive measures that minimize the need for remedial action, and upholds an environment of integrity by contributing to the maintenance of the highest standards of personal and professional conduct by UNHCR workforce. The IGO participates in the development of relevant UNHCR policies, monitoring implementation and impact through inspection, investigation and ad hoc inquiry activities. 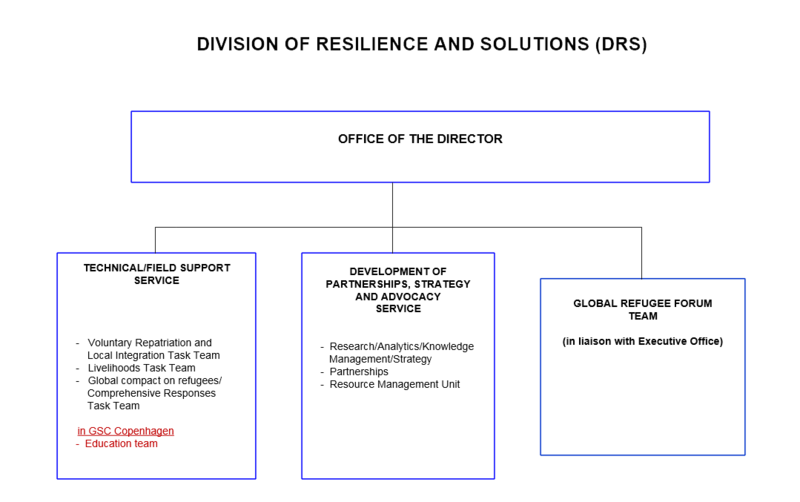 The Evaluation Service (ES) manages the centralized evaluations primarily focusing on policies, strategies, programs and themes of corporate significance at the global, strategic level and for Level 3 emergency operations. ES provides also support, guidance and quality assurance oversight of decentralized evaluations commissioned by Divisions, Regional Bureaux and/or Regional and Country offices for activities, themes, and operational areas, strategies, at the country or regional level. The Governance Service is responsible for maintaining an effective relationship between UNHCR’s Executive Committee (ExCom) and UNHCR. The Service interacts closely with the Senior Executive Team and with other Services, Divisions and Regional Bureaux as well as with external stakeholders and manages all aspects of the work of ExCom, including the annual ExCom session, Standing Committee meetings, informal consultations and briefings, while keeping the ExCom Bureau engaged and abreast of important developments in UNHCR. The Service also provides editorial and translation services and protocol advice for the documentation of ExCom meetings, all other governance-related documentation and the High Commissioner’s correspondence, including letters of accreditation. The New York Liaison Office (NYLO) represents UNHCR at UN Headquarters in New York by promoting the Organization’s policies, strategic priorities and advocacy messages. NYLO promotes the needs of people of concern through participation in fora on humanitarian reform and financing, maintaining international peace and security, protection of civilians, human rights mainstreaming, and sustainable development, as well as other relevant New York-led initiatives. NYLO contributes to the formulation of resolutions by the Security Council, the General Assembly, and its subsidiary bodies, as resolutions pertain to people of concern. It also provides input to reports of the Secretary-General and other strategic reviews. Through collaboration with NGO partners, key UN Secretariat entities, and agencies, funds and programmes in New York, NYLO provides strategic advice to the High Commissioner on evolving political and policy matters that may affect the work of UNHCR. The Ethics Office ensures that all individuals of UNHCR’s workforce observe and perform their functions with the highest standards of integrity, by fostering a culture of respect, transparency and accountability throughout the Organization as required by the UN Charter, the UNHCR Code of Conduct, and UN Staff Regulations and Rules. It develops ethical standards in collaboration with the UN Ethics Office and the UN Ethics Panel; promotes and disseminates ethics-related policies; and provides guidance to staff members and senior management on ethical standards and dilemmas to address and prevent problems before they emerge. It coordinates the annual refresher courses on the Code of Conduct to UNHCR operations globally; oversees the policy on protection from retaliation for individuals who report misconduct or participate in audits, inspections, investigations, inquiries or the work of the Ombudsman; and administers the Financial Disclosure Programme. The Legal Affairs Service (LAS) is UNHCR’s central legal office on non-refugee law matters and is responsible for planning, coordinating and managing the Organization’s legal affairs. This includes advising on various legal aspects of UNHCR’s operations and activities, as well as preparing agreements regulating UNHCR’s relations with hosting countries and other entities; procurement and commercial contracts; and claims and disputes involving the Organization’s operational activities. LAS also works to reduce potential financial and other types of loss through legal risk analysis; protects the interests of the Organization in internal administration of justice proceedings; and contributes to ensuring that UNHCR’s activities are carried out in accordance with its internal regulatory framework and relevant law. The Ombudsman’s Office provides a confidential, impartial and independent service for the informal resolution of work-related problems and conflicts. It offers an informal alternative to formal complaint- handling systems, such as the Inspector General’s Office, the Management Evaluation Unit or the United Nations Dispute and Appeals Tribunals. Recourse to the Ombudsman is voluntary and strictly confidential. Wherever possible, the Ombudsman helps individuals to develop new ways to solve problems themselves and works primarily through negotiation, influence, personal powers of persuasion and good practice. The Enterprise Risk Management (ERM) Unit supports managers at all levels of the Organization in discharging their responsibilities in respect of UNHCR’s ERM policy. The ERM Unit is complemented by a network of risk management focal points across the Organization to decentralize the capacity for managing risk both in the Field and at Headquarters. UNHCR Innovation Service is an interdivisional initiative launched in 2012 and officially established as a unit in December 2014 for creating and disseminating new ideas and knowledge within UNHCR. It works at integrating fresh perspectives on education, energy, communications, shelter, and livelihoods. UNHCR Innovation's approach has three facets: i) amplify innovations already happening within UNHCR; ii) connect innovators within UNHCR to resources, to one another, and to external partners and mentors; and iii) explore innovations happening outside the Organization and looking for ways to adapt existing innovations to the needs of people of concern. Change Management and the Organizational Development and Management Service (ODMS) merged on 1 October 2018. As a follow-up to the Rapid Organizational Assessment undertaken during the first phase of the Headquarters Review, the High Commissioner appointed a Director of Change Management to oversee a second phase of the Headquarters Review, including implementation of accepted recommendations of the Rapid Organizational Assessment and the management of any additional change initiatives. The Director for Change Management, supported by the Change Team, reports to the High Commissioner, with regular coordination of on-going issues with the Deputy High Commissioner, and interacting on a regular basis with members of the SET. When an emergency has been declared by the High Commissioner and within the framework of the Policy on Emergency Preparedness and Response (UNHCR/HCP/2017/1), DESS is called upon to provide operational advice and support to the relevant Regional Bureaux, country operations as well as to the Assistant High Commissioner for Operations (AHC-O). Reporting to the AHC-O, DESS is responsible for providing strategic direction, support and oversight to Regional and Country Offices in relation to emergency preparedness and response, supply chain management, and the security of colleagues and persons of concern. Considering the high visibility and cross-cutting impact of its operational areas, DESS keeps the High Commissioner, the Deputy High Commissioner and the Assistant High Commissioners informed of significant developments concerning the delivery of its primary functions. The Director of DESS oversees and provides strategic direction and guidance to the Division in order to ensure coherence among its components as well as an effective overall response and represents UNHCR in the IASC Emergency Directors Group. The Director is UNHCR’s security focal point for UNDSS, supported by the Head of FSS. The Deputy Director, principally responsible for coordinating and supporting, among others, the functions of the Emergency Service, including smooth and effective links with the Supply Management Functions and the Field Security Service, on all aspects of emergency preparedness and response. Reporting to the Director, the Compliance and Risk Management Unit (CRMU) is responsible for coordinating audit activities and following up on recommendations, monitoring supply transactions to help ensure compliance, overseeing the development of supply-related guidance material, maintaining DESS risk registers and for quality management related to Core Relief Items (CRI). The Director of DESS is also supported by the Resource Management Unit to manage the resources of the Division, including staffing, operational and administrative budgets. The Emergency Service has the overall responsibility for providing guidance and supporting the emergency preparedness and response capacity of the Organization in line with Refugee Coordination Model (RCM) for refugee crises and the inter-agency framework of the for IDP crises, within the framework of UNHCR’s Policy on Emergency Preparedness and Response (UNHCR/HCP/2017/1). The Emergency Standby Team, led by the Principal Emergency Coordinator, comprising colleagues with multi-functional profiles who can be immediately deployed according to operational needs and support the assessment and response to the various phases of an emergency. The Standby Team provides rapid and effective response to ensure the centrality of protection, with community-based and Age, Gender and Diversity approaches as well as with a particular focus on Child Protection and the prevention of Sexual and Gender-Based Violence from the outset of the emergency. The Emergency Policy and Capacity Development Section is responsible to develop policies for appropriate emergency preparedness and response, taking into account operational needs and the inter-agency environment. The Section undertakes Real Time Reviews of Level 2 and Level 3 emergency operations and ensures that lessons learned from these reviews and those drawn from field experience of emergency standby teams and other deployments are incorporated into emergency policy guidance, training and capacity development and internal procedures. Through the UNHCR Emergency Handbook, it helps ensure that emergency guidance is accessible to colleagues and partners in the Field. The Section works closely with the Global Learning and Development Centre (GLD) on the design and delivery of the Workshop on Emergency Management (WEM), the Senior Emergency Leadership Programme (SELP) and other emergency related training. The Section also oversees the Regional Centre for Emergency Preparedness (e-Centre), located in Bangkok and headed by a Coordinator who works with offices throughout the Asia-Pacific region promoting preparedness in the context of humanitarian emergencies. The Emergency Preparedness Section is responsible for establishing global standards and tools to support UNHCR’s and inter-agency activities on preparedness for refugee and IDP emergencies. It oversees, guides and technically supports the development of country-specific emergency preparedness plans. This includes maintaining UNHCR’s High Alert List for Emergency Preparedness (HALEP), the global repository of preparedness information for countries and situations at medium and/or high risk of refugee emergency, to ensure the global picture on emerging risks and enable mobilization of support for countries and situations with significant gaps in preparedness. The Section also contributes to UNHCR’s and inter-agency risk analysis and contingency planning. It represents UNHCR in the IASC Reference Group on Risk, Early Warning and Preparedness, including the early warning working group and Emergency Response Preparedness (ERP) work stream. The Emergency Preparedness Section contributes to UNHCR’s global emergency preparedness in regard to deployments and partnerships. The Emergency Deployments and Partnership Unit, which is an integral part of the Section, manages internal emergency deployments drawn from the Emergency Response Team (ERT) roster, the Senior Corporate Emergency Roster (SCER), the functional rosters, as well as other emergency staffing deployments. It coordinates the selection of candidates for the Workshop on Emergency Management and the ERT. It also coordinates the deployment of standby partners’ staff and collaborates with the Field on deployment of the service packages by the International Humanitarian Partners’ (IHP) members. The Section further manages partnerships with UNHCR´s extensive network of NGOs, governments and civil response partners that have emergency standby partnership agreements with UNHCR. The Field Security Service (FSS), led by a Head of Service, is responsible for providing global advice and support on security and safety issues. FSS deploys Field Security Advisers (FSAs) including one with special engineering skills in support of country/regional operations. The Service develops and promulgates guidance on safety and security of persons of concern to be used by all colleagues and implementing partners in conjunction with DIP and other Divisions. The Head of FSS directly supervises a team of field security advisers at Headquarters. FSS also oversees two Global Field Security/Safety functions in Nairobi and Bangkok, respectively. Providing technical support and oversight in support of operations, FSS also closely works with the Global Learning and Development Centre to determine and approve the content of global security learning programmes. FSS is responsible for security oversight and, through UNHCR‘s Security Steering Committee (SSC) facilitates conduct of reviews of high-risk operations, monitors compliance with security risk management measures determined and supports unanticipated security-related needs. FSS represents UNHCR’s security interests in the Inter-Agency Security Management Network (IASMN) and through all the associated working groups of the UN Security Management System. It is a member of the Saving Lives Together Oversight Committee to support partners and NGO personnel and is the organizational focal point for Programme Criticality and a member of the Programme Criticality Coordination Team. It is also serves as focal point for UN Civil Military Coordination. The Procurement Field Support Section provides procurement support to UNHCR field operations according to geographical areas (Africa, Europe, MENA, Asia and Pacific, and the Americas); supports partner pre-qualification and assists and guides UNHCR operations on procurement issues. The Section is providing guidance to field operations regarding acquisition or rental of land and buildings, as well as technical support on engineering matters related to property, building and leasing projects and maintains a database of UNHCR’s land and buildings, either owned or under the right-of use agreements and a central repository of all lease agreements. In addition the field procurement section assists field offices with procurement actions related to cash-based interventions (CBI). Reporting to the Deputy High Commissioner, the Division of Financial and Administrative Management contributes to safeguarding the financial resources entrusted to UNHCR by maintaining and improving the financial and administrative systems, policies and procedures and promoting cost-effective and transparent use of these resources. DFAM advises and monitors UNHCR’s overall compliance with financial rules, regulations and related internal controls and is also responsible for the preparation of the annual financial statements of UNHCR. DFAM develops financial policies and guidance as well as management reports and accounting analysis to assist decision-making on the use of resources and aims at strengthening the financial management capacity in the Field and in Headquarters. DFAM manages the process of establishing UNHCR's budget, monitors its execution and reports on its implementation while leading UNHCR's efforts to improve performance management and accountability of implementing partners. It also plays a key role in UNHCR's efforts to improve oversight and audit mechanisms. The Director of the Division also serves as the Organization's Controller. The Controller has a direct reporting line to the High Commissioner in respect of the delegated authority for the application of the Financial Rules. In line with the Article 10 of these Rules, the Controller is responsible for establishing and maintaining internal controls to ensure the financial integrity of the Organization, The Controller also acts as Chairperson of the Headquarters Asset Management Board (HAMB), the Headquarters Committee on Contracts (HCC) and Alternate Chairperson to the Deputy High Commissioner for the Budget Committee (BC). 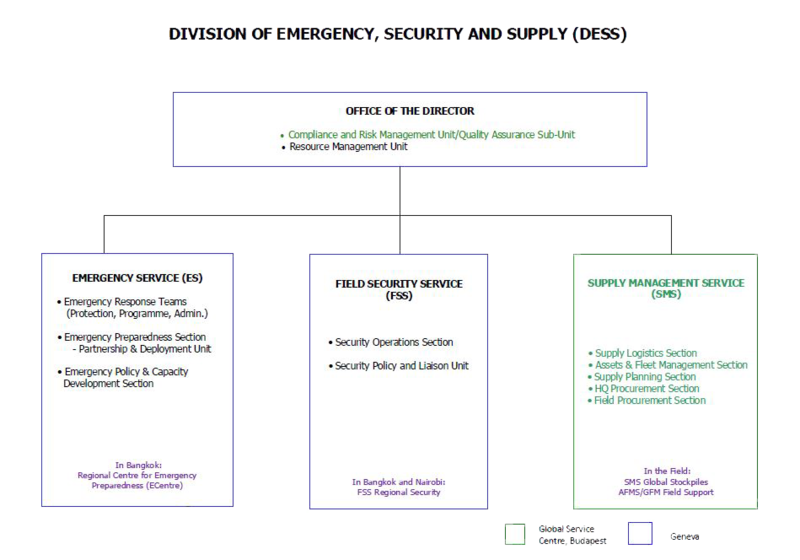 The Division comprises the Office of the Controller, the Programme Budget Service, the Implementing Partnership Management Service, the Accounts and Financial Service, the Treasury and Cash Service, the General Services Section, and the Change Management and Field Support Section and the System Administration Section. The Office of the Controller has responsibility for the overall management of the Division and also hosts the Secretariat of the Headquarters Committee on Contracts. Within this Office, the Policy and Audit Coordination Section (PACS) contributes to the development of corporate level policies and strategies concerning financial, accounting and administrative management. It provides advice and guidance to finance staff in UNHCR offices worldwide on policy-related matters. PACS is also responsible for coordination of all external audit matters and acts as the focal point in UNHCR for the relation with the United Nations Board of Auditors (BoA). The Section reviews BoA audit observations and recommendations, coordinates the Organization’s responses to the BoA reports, and prepares overviews of key audit findings. It also provides expert advice and support on audit-related matters. In close collaboration with the Division of External Relations and the Legal Affairs Service, PACS provides DFAM clearance on all funding agreements particularly any deviation from the standard financial clauses or if there are specific requirements/clauses with financial implications. 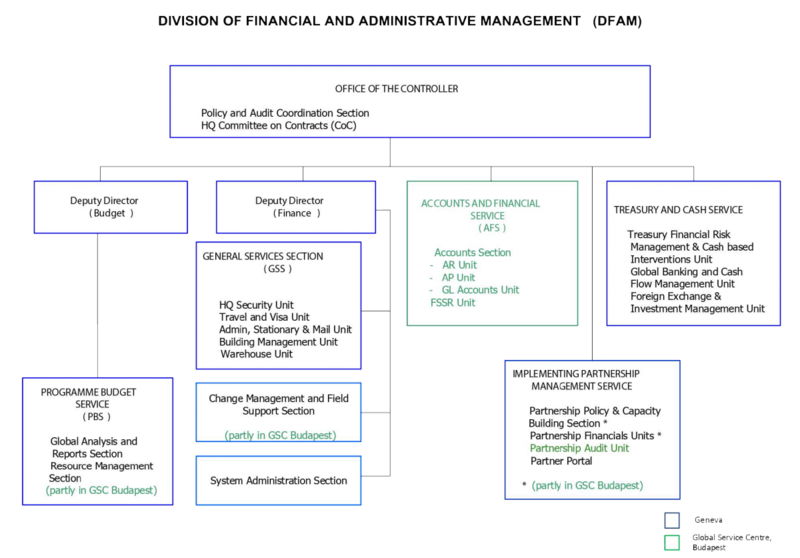 The Deputy Director (Finance), reporting directly to the Controller, oversees the following Sections in Geneva and partly in Budapest: the Change Management and Field Support Section (CMFSS), the General Services Section (GSS) and the System Administration Section. CMFSS supports the Controller in improving the financial management capacity of UNHCR by ensuring the efficient and successful implementation of initiatives relating to financial management and control, including development and oversight of communications and training on financial management and other related subjects. System Administration Section provides support services, administers role-based access rights to UNHCR`s ERP system, ensuring the application of the current Financial Internal Control Framework (FICF) and Delegation of Authority Plan (DOAP). The General Services Section (GSS) is responsible for management and coordination of security services, building and facilities management at Geneva Headquarters, as well as for the administration of official travel originating from Headquarters. Monitoring implementation of UNHCR's biennial budget and results-based budgeting and providing support on the use of relevant system applications. PBS also provides the secretarial support to the Annual Programme Review (APR) process and the Budget Committee (BC). It delivers input to Senior Management on the APR as well as to the mid-year and annual review in respect of resources allocation process. PBS is also responsible for the preparation of the Biennial Programme budget and participates in regulatory and legislative meetings to discuss budgetary matters. The Accounts and Financial Service (AFS), based in Budapest GSC, reports to the Controller, and is responsible for the preparation of statutory and management financial information used in UNHCR’s statements. It plays an essential role in ensuring that the Organization's financial statements comply with UN/UNHCR Financial Regulations and Rules and strives to strengthen the quality of financial management and control in UNHCR. It also provides advice and guidance to finance staff in UNHCR offices worldwide. The Treasury and Cash Service (TCS), based in Geneva, reports to the Controller. TCS provides leadership in core treasury and financial risk management, applying best practices in global liquidity, foreign exchange and investment management to safeguard the cash holdings of the Organization worldwide. The Service also provides integrated guidance for the delivery of Cash Based Interventions (CBI) embedding financial governance to manage specific financial risks associated to cash delivery requirements. This involves systematically integrating CBI applications into a standardized financial control framework and establishing best practices in cash and financial management to streamline approaches for country implementations. The Implementing Partnership Management Service (IPMS), based in Geneva, with some positions located in Budapest GSC, reports to the Controller and is responsible for all matters related to the management of the framework for Implementing with Partners within the Organization, including setting policies, designing procedures, providing guidance, coordination, and implementation of strategies, as well as managing UNHCR´s `Partner Portal`. The Division of International Protection (DIP) leads the progressive development of international law and protection policy relating to forced displacement and statelessness. The Division provides the necessary thematic, functional and operational support to enhance protection delivery, and it exercises these responsibilities in relation to all populations of concern to UNHCR. The Division provides guidance on the legal and operational complexities of displacement, migration, refugees, asylum and resettlement with regard to protection of persons and populations of concern to the Organization. It helps to plan global policy and allocate resources that best address the protection needs of communities on the ground, and its purview particularly covers children and those at risk of sexual and gender-based violence (SGBV). DIP works with Regional Bureaux, Field Offices, other Headquarters bodies and partner organizations, including governments, judiciaries and inter-and non-governmental institutions to deliver the human rights objectives enshrined in UNHCR’s mandate. The Protection Policy and Legal Advice Section develops and positively influences the implementation of international law and standards in the area of forced displacement by providing governments, international organizations, UNHCR staff and the legal community with guidance on protection issues and policies, including within the context of the work of the Executive Committee. PPLA also comments and advises on national legislation related to protection, and facilitates and supports the preparation of court interventions by UNHCR around the world as well as overseeing the implementation and evolution of UNHCR’s data protection policy regarding persons of concern. The Asylum and Migration Unit addresses challenges arising from the links between refugee protection and international migration, and works to ensure that solutions for refugees are built on a thorough understanding of the dynamics of international migration. The Unit advocates for States, international organizations, regional, multilateral and inter-agency bodies and other actors to develop laws, policies, practices and strategies which comply with applicable international and regional human rights, refugee and statelessness law standards, and ensures that refugees, asylum-seekers and other persons with specific protection requirements are identified and their needs properly addressed. Among the key themes of its remit are protection-sensitive entry management, including in relation to interception and rescue at sea as well as at land and air borders, and combating human trafficking and smuggling in human beings. The Human Rights Liaison Unit contributes to the development of international human rights law and standards and to the strengthening of the existing normative framework for refugee protection. The Unit promotes the effective use of international human rights law and standards for advocacy as supporting protection tools for UNHCR’s operations worldwide, providing the Organization with advice and capacity-building initiatives. It acts as the main liaising body at the global level between UNHCR and a variety of UN human rights mechanisms, including the Human Rights Council (HRC), the Office of the High Commissioner for Human Rights (OHCHR), human rights treaty monitoring bodies and various Special Procedures mandate holders. The Unit also cooperates with a broad array of other human rights actors such as the Council of Europe (CoE), EU Fundamental Rights Agency (FRA), the Office for Democratic Institutions and Human Rights (ODIHR), UNICEF, the UN Development Group’s Human Rights Working Group, and with existing regional human rights systems in Europe, the Americas, Africa and Asia, in order to strengthen human rights approaches. Assisting UNHCR staff, states and others stakeholders by providing capacity building and training programmes relating to evidence assessment and information management tools. The Protection and National Security Section leads efforts to ensure that measures to address terrorism, as well as serious crimes that threaten national or international security and public order, comply with international legal obligations towards persons of concern to UNHCR. The Section advises and supports other parts of DIP, Regional Bureaux and entities in the Field on doctrinal and procedural questions concerning exclusion, security and related issues, including in the context of individual case processing, court interventions and comments on national legislation, and works with relevant Divisions, other parts of DIP, Regional Bureaux and the Field on developing UNHCR’s policy responses to security-related challenges in the area of protection. The Statelessness Section develops doctrine and policy guidance to help Field Offices and Headquarters implement UNHCR’s mandate to prevent and reduce statelessness and protect stateless persons. The Section works with the GLDC to develop and conduct training programmes on the theme of protection of stateless persons, leads UNHCR’s #IBelong Campaign to End Statelessness by 2024, and together with DPSM and PASS initiates and develops programmes and best practice to guide stakeholders in their planning and implementation of activities related to statelessness. The Protection Operational Support: From the onset of emergencies, Protection Operational Support helps to strengthen preparedness and response to the most critical protection risks through analysis, guidance to field operations, emergency deployments, and mobilizing of partners and other actors. It analyses and processes protection capacity and knowledge in order to address acute protection concerns arising from conflict and natural disaster, ensuring that Headquarters presence, leadership and coordination are effective and support mechanisms of preparedness and response to refugee situations. The Child Protection Unit provides assistance, advice and support to Bureaux and field operations by implementing UNHCR’s policies and strategies to protect forcibly displaced and stateless children and youth. The Unit develops guidance and practical tools relating to the protection of children and youth and works at the global level, both bilaterally and in inter-agency fora, to enhance and expand operational partnerships. The Gender Equality Unit promotes gender equality at all levels within UNHCR ‘s activities through initiating and promoting appropriate policy and guidance, technical assistance, advice and hands-on support. The Gender Equality Unit seeks to implement the Age, Gender and Diversity (AGD) policies, advocating for and supporting programmes of inclusion and targeted actions to address discrimination and protection gaps affecting specific groups of persons of concern. The Sexual and Gender-Based Violence Unit supports UNHCR field operations in establishing prevention and response mechanisms to address this core protection issue. The SGBV Unit supports Regional Bureaux to implement UNHCR’s SGBV strategy by developing policy and guidance and offering technical assistance, advice and support, including through expert deployments. It also builds capacity among UNHCR staff and partners on SGBV issues, and participates in inter-agency networks and partnerships to promote enhanced SGBV prevention and response approaches for forcibly displaced and stateless groups. The Emergency Protection Support Unit provides real-time guidance to the Field and Headquarters in and during the various phases of an emergency. It works with all Divisions and Bureaux to provide practical support for implementing the Refugee Coordination Model and for developing effective protection and solutions strategies, ensuring that AGD provisions are assessed and put in place at the community level. The Emergency Protection Support Unit helps to mobilize appropriate resources to support protection in emergencies, addresses the technical and coordination aspects of deployments of staff and resources, and provides technical input into planning and appeal documents. The Internally Displaced Persons Section provides policy guidance and operational support to field operations. It contributes to the development of protection strategies as well as to the design and implementation of operations in IDP situations. The IDP Section represents UNHCR in the Global Protection Cluster, putting forward the views of UNHCR’s operations as well as the Organization’s global policies and positions on the protection of internally displaced persons. It collaborates with the Special Rapporteur on the Human Rights of IDPs to offer guidance and technical advice. The Global Protection Cluster Unit supports the coordination of a broad range of entities specializing in protection issues and reaches out to political, military and development bodies to ensure that protection remains a key component of all humanitarian responses to crises arising from conflict and natural disaster. It represents UNHCR’s roles and responsibilities within the Inter Agency Standing Committee (IASC) and supports UNHCR’s agency leadership of the Protection Cluster at the global and Field level. Through multiple partnerships, the GPC Unit helps building response capacity at field level, including through innovative protection approaches and tools. The GPC Unit promotes country and global protection advocacy, strengthens partnerships, supports resource mobilization, and carries out support missions to assist Humanitarian Coordinators and Humanitarian Country Teams to analyse situations requiring protection, response and strategic solutions. The Community Based Protection Unit develops policies, systems and tools while offering technical support to advance the development of UNHCR’s community-based and non-discriminatory approach in humanitarian response. The Unit places a particular emphasis on social cohesion, conflict resolution, support to community initiatives and national civil society. CBPU’s responsibilities include supporting country operations in improving the protection for LGBTI persons of concern as well as advancing the protection benefits of cash-based interventions (CBI), building and strengthening partnerships and networks with civil society and community organizations within countries and regions. Participating in relevant inter-agency fora and working with the Annual Tripartite Consultations on Resettlement (ATCR) involving states, NGOs and UNHCR and its associated thematic Working Groups on Resettlement, as well as with case-specific Core and Contact Groups, acting as Secretariat to the rotating states and NGO chairs, and coordinating UNHCR’s participation and follow-up of outcomes from these meetings. Reporting to the Deputy High Commissioner, the Division of Information Systems and Telecommunications provides a secure and evolving digital ecosystem for UNHCR across the globe, ensuring the right information and communications solutions are designed, developed and maintained in a cost-effective, timely and secure manner, enabling UNHCR to fulfil its mandate. Furthermore, as per UNHCR Policy on Emergency Preparedness and Response [UNHCR/HCP/2017/1], DIST is responsible for information and communications technology (ICT) emergency preparedness and response support including provision of overall ICT coordination capacity in line with the Refugee Coordination Model. DIST is a geographically dispersed division - with its workforce spread between Geneva, Copenhagen, Budapest, Amman, Bangkok, Nairobi and Panama - working closely with the ICT workforce in the field to ensure global alignment and effective implementation of the Organization’s ICT strategy. DIST is comprised of the Office of the Chief Information Officer (CIO), and three Services (Business Relationship Management Service; Customer Support Service; and ICT Operations Service). The Division is led by the Director, who also serves as the Organization’s Chief Information Officer, who is responsible for the overall technology direction of the agency. Other units with direct reporting lines to the CIO include the ICT Emergency Preparedness and Response Section; the Project Management Office; the Vendor Management and Supply Unit; the Governance, Risk and Compliance Unit; and the Resource Management Unit. The Office of the CIO is responsible for providing information technology leadership and support, encompassing ICT strategy, emergency response, communication, performance monitoring, policy development, investment planning, compliance and oversight, supplier relationship management, and resource management. The ICT Emergency Preparedness and Response Section (EPRS) is responsible for ensuring UNHCR has the capacity, processes, and resources in place to effectively support the Organization’s preparedness for and response to displacement crises. The ICT Portfolio Management Office (PMO), utilizes the UNHCR Project Management Life Cycle, to provide a structured process and clear governance model for UNHCR’s ICT projects, enabling their successful delivery while remaining on schedule and within budget. The PMO is the liaison between DIST and the ICT Governance Board, which ensures that ICT project investments are aligned with UNHCR’s operational priorities and Global Strategic Directions. The Governance, Risk and Compliance Unit acts is responsible for risk management activities, audit reviews of ICT systems and any follow-up recommendations and action plans. It carries out regular risk analysis and compliance reviews on existing ICT systems, as well as coordinates the development and promulgation of ICT Policies and Guidelines. The Vendor Management and Supply Unit focuses on the contractual aspects of external vendor management, overseeing public tenders for ICT goods and services, the vendor review and negotiation process, and interaction with UNHCR’s legal and supply functions. It is also responsible for procurement, warehouse, and inventory management, particularly in support of operational emergencies. The ICT Solution Engineering Section is focused on optimizing the design, development, implementation and evolution of solutions with significant ICT components and work with the business as well as external service providers to ensure that UNHCR solutions are fit-for-purpose. DIST’s Resource Management Unit provides administrative, budgetary, financial, human resources, and supply support functions. The Business Relationship Management Service builds strategic partnerships with Divisions and Regional Bureaux at Headquarters, enhancing use of ICT to improve UNHCR’s efficiency and effectiveness. Through focal points assigned for all Divisions and Regional Bureaux at Headquarters, as well as specific leads for critical application areas, BRMS ensures services provided by DIST are appropriate and effective in meeting the Organization’s ICT needs. Within this Service, the Refugee Systems Section is responsible for delivering, maintaining and improving the portfolio of applications (e.g. proGres, RApp, CashAssist, etc.) that support UNHCR’s direct protection services to refugees, including registration, status determination, and resettlement. The MSRP and RBM Section delivers and maintains applications that support the core corporate functions of Finance, Supply Chain, Enterprise Performance Management, Human Resource Management, Results-Based Management. The Collaboration and Communication Section interacts with DIST’s business partners to deliver collaboration, communication and knowledge management systems, including the Intranet, SharePoint, corporate websites and eSAFE. The Customer Support Service is responsible for ensuring that colleagues globally who use ICT equipment and systems to execute their work are provided with the necessary support they require. It manages external providers to ensure service delivery meets agreed standards. Within the Service, the Global Service Desk Unit is responsible for ensuring that all reported ICT incidents are resolved, and that service or product requests raised by the user community are fully addressed. Global Service Desk analysts are available 24/7. The ICT Field Operations Section is the direct link between DIST and the ICT workforce in the field. Regionally-based ICT Officers, a field-based ICT workforce, and managed service providers provide global on-site ICT support services, ensuring that business as usual operations run smoothly. The ICT Cross Functional Unit is responsible for a series of functions that span the three DIST services, including change management, asset management, and configuration management. The ICT Operations Service is responsible for delivering and maintaining UNHCR’s ICT infrastructure that enables provision of all services within DIST’s sphere of operations. Located primarily in Amman, the Service oversees the day-to-day interaction with outsourced service providers through the service delivery management process. Within the Service, the Information Security Section develops and ensures compliance with policies and standards in relation to ICT security for both applications and infrastructure. It also evaluates existing security mechanisms and makes recommendations for improvements or corrective action. The ICT Network and Telecoms Section is responsible for delivery of network services on which all other ICT services rely, including increasing efficiency of internet connectivity and extending its reach to deep-field locations. The ICT Platform Section develops and implements common platform services on which UNHCR’s corporate applications can operate, including leveraging the services available through cloud technology. They manage the data centre hosting arrangements with outsourced service providers (UNICC, SafeHost, etc.) and ensure the agreed service levels are met. The End-User Devices Unit is responsible for ensuring efficient delivery of corporate applications through configuring, supporting and defining common standards for infrastructure used by the UNHCR user community, including desktops, laptops, tablets, and other mobile devices globally. 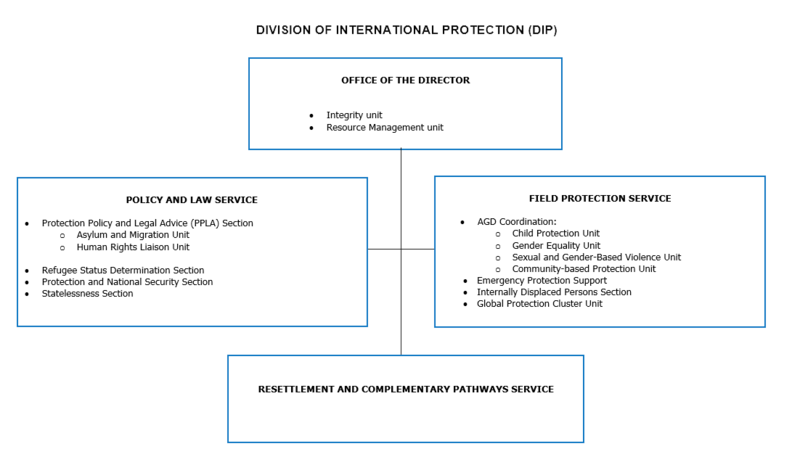 Reporting directly to the Assistant High Commissioner for Protection, the Division for Resilience and Solutions (created by the High Commissioner in 2018 based on the recommendations of the Rapid Organizational Assessment (ROA) brings together a number of functions performed by workforce and teams earlier placed in DIP, DPSM, DER and the CRRF Task Team. DRS seeks to identify solution opportunities for refugees and internally displaced persons, by addressing the underlying causes of displacement, including statelessness. Going beyond the three durable solutions and looking at building resilience for solutions throughout the displacement cycle, DRS addresses the legal, economic, civil, and political constraints to solutions. The new Division combines the features of a traditional structure with a more dynamic, innovative way of collaborating across existing Divisions and Regional Bureaux and interacting with and responding to the needs of operations in the Field. The Technical & Field Support Service with task teams focusing on voluntary repatriation and local integration; livelihoods, self‐reliance and resilience; global compact on refugees and comprehensive responses and education. The Service supports Regional Bureaux, and by extension, field colleagues in developing viable solutions‐oriented strategies and approaches that take into account context‐specific opportunities and constraints. In particular, this Service builds on the experience of the CRRF team in rolling out UNHCR’s comprehensive approach to responding to both emerging large‐scale refugee populations and protracted refugee situations. The Development of Partnerships, Strategy and Advocacy Service is in charge of research, analytics, and knowledge management to build solutions-oriented strategies and support the partnerships with World Bank and other development actors. The Service promotes integration of refugees into existing national services and access to local economies, ensuring access to basic rights, fostering self‐reliance and economic interdependence through effective programme design and delivery. It maintains partnerships with national and development actors, with particular attention to relationships with World Bank and other financial institutions, states and other development actors. The Service is also engaged in advocacy and resource mobilization for host communities and refugees and is responsible for developing solutions strategies and prevention. In coordination with the ExCom Secretariat (within the Governance Service), this team steers the preparations for the first Global Refugee Forum, to be held in December 2019. The Forum is a key element of the new arrangements established under the global compact on refugees, and will be held every four years. The first Forum will play a vital role in driving forward the responsibility-sharing agenda. Reporting to the Assistant High Commissioner for Operations, the Division of Programme Support and Management leads efforts to strengthen programme quality, capacity and Results-Based Management (RBM), provides analysis to inform management decision-making on resource allocation, sets global strategies, policies and standards, develops practical guidance and tools, and promotes new operational approaches across a wide range of technical areas that are essential for the protection of UNHCR’s persons of concern. Based in Geneva, Copenhagen GSC and Regional Service Centres in Nairobi and Bangkok, DPSM directly supports field operations through deployments and global technical specialist networks. The Deputy Director for Technical Support, responsible for the Public Health Section (PHS), Shelter and Settlement Section (SSS), and Energy and Environment Unit. Each Section is headed by a Chief of Section who reports to the respective Deputy Director. The Director of DPSM also provides management direction to Global Cash Operations (GCO) Project, and oversees the inter-divisional Results-Based Management (RBM) Project as the Project Owner under the Deputy High Commissioner’s guidance “Project Sponsor”). 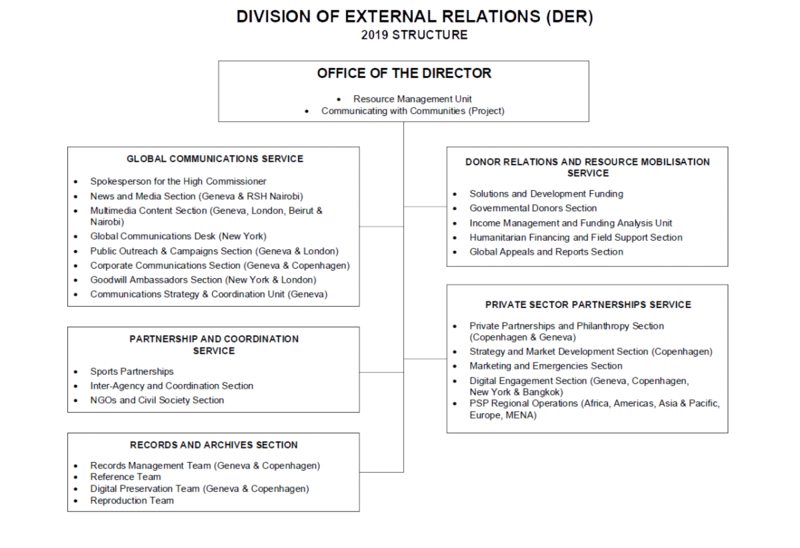 The Office of the Director oversees and provides strategic guidance to the Division and supports the development and implementation of policies and strategies, identifies and coordinates unifying elements and strategies for cross-cutting issues, and coordinates overall operational support for programme management. 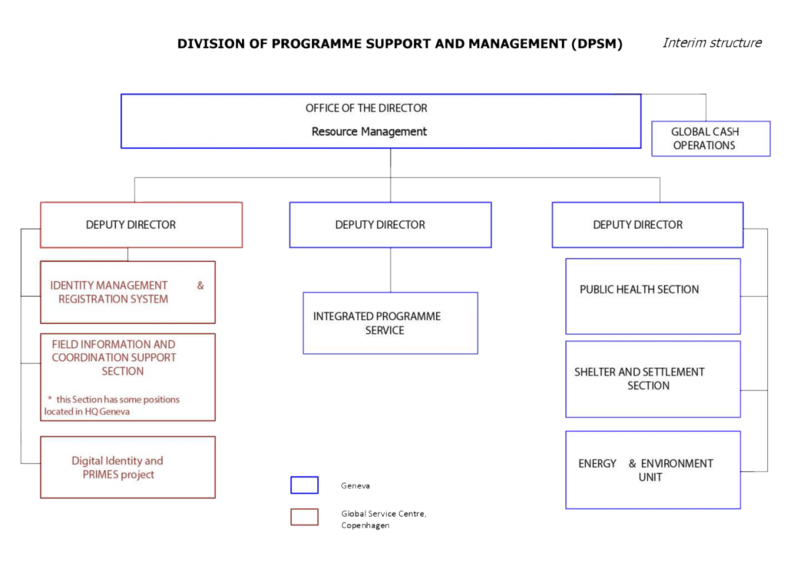 The Director manages the Division's resources through the Resource Management Unit (RMU), including staffing, programme and administrative budgets, and ensures coordination with other Divisions and Bureaux at the strategic level. The Integrated Programme Service (IPS), based in Geneva, coordinates programme management and provides strategic direction and guidance on all aspects of operations management. The Service builds global programme management capacity and provides direct support to offices in the Field. IPS is responsible for the programme management tools Global Focus Insight and Focus Client, as well as for the Global Strategic Priorities, and forms part of the Secretariat for the Annual and Mid-Year Programme Reviews. The Field Information and Coordination Support Section (FICSS), mainly based in Copenhagen Service Centre with liaison positions in Geneva, supports operational data management systems necessary for the planning, management and delivery of UNHCR’s programmes. FICSS ensures UNHCR's co-leadership of the Global Camp Coordination and Camp Management (CCCM) Cluster and hosts the inter-agency Joint IDP Profiling Service (JIPS). The Section sets policies and standards, develops tools and approaches and provides capacity building and direct Field support in the areas of information management, population and operational data, geographical information systems and mapping, statistics, needs assessments and surveys. The Identity Management and Registration Section (IMRS), based in Copenhagen GSC, strengthens the framework of identity and case management policy and guidance, upgrading related tools and operational approaches. The Section provides technical support and builds capacity in field operations for registration, identity management and case management. It also works with the dedicated DPSM-DIST Project Team to support development and the global deployment of proGres version 4 and the Biometric Identity Management System (BIMS). The Public Health Section (PHS), based in Geneva, is responsible for policy and standard setting, technical support and guidance, as well as monitoring and evaluation in the areas of Public Health and HIV, Reproductive Health, Water, Sanitation and Hygiene (WASH), and Nutrition and Food Security. The Section works to continuously strengthen its technical networks and plays an important role in emergency response. The Shelter and Settlement Section (SSS), based in Geneva, provides technical support to enhance UNHCR` s capacity to respond to the shelter needs of refugees and others of concern. SSS supports development of global and country-level shelter strategies, site plans and tools, conducts research and development on innovative shelter solutions, and establishes technical specifications for shelter materials and related core relief items. The Section also ensures UNHCR’s co-leadership of the Global Emergency Shelter Cluster. The Energy and Environment Unit, based in Geneva, ensures strategy and policy development, as well as support to field operations on durable energy solutions, environment, climate change adaptation and disaster risk reduction. The Global Cash Operations Project (GCO), based in Geneva, provides overall coordination, guidance and technical support for institutionalizing cash-based interventions in UNHCR and ensuring their expanded and systematic use in field operations. The Section works to adapt policies and procedures, develop guidelines and approaches, and improve tools and systems to strengthen UNHCR’s technical capacity to implement CBIs.